For years, you've heard that shooting in RAW is better than shooting JPEGs. Your camera's RAW mode packs significantly more visual information, so it offers the potential to capture better photos. That comes at a cost, however, since you need to do extra work to coax better photos out of your camera. 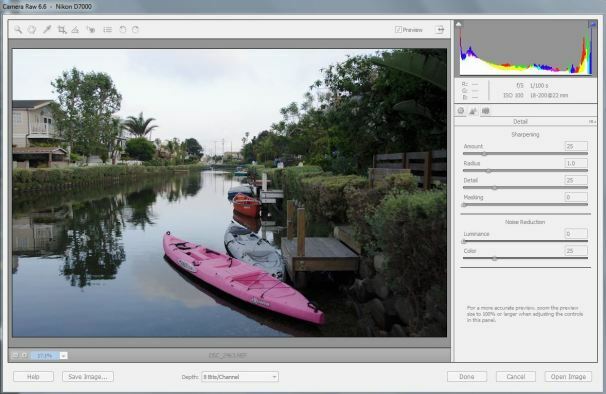 To help you do that, most photo editors come with some sort of mini photo editor that you can use to tweak RAW images. Photoshop Elements calls it Camera Raw; Corel PaintShop Pro calls it Camera RAW Lab. If you've always ignored such programs, give them a second look. Why Use a RAW Editor? This is the same reason that I recommend programs such as Lightroom or AfterShot Pro--they dispense with all the graphical-design baggage packed into a full-featured image editor like Adobe Photoshop, and include only the stuff that's important to photographers editing photos. In the same way, a RAW editor is a photo editor stripped to the bone, sporting just the features you need to correct color and exposure. A lot of the time, you could make a few tweaks in the RAW editor and be done, never needing to mess with the bigger Photoshop, Photoshop Elements, or PaintShop Pro. 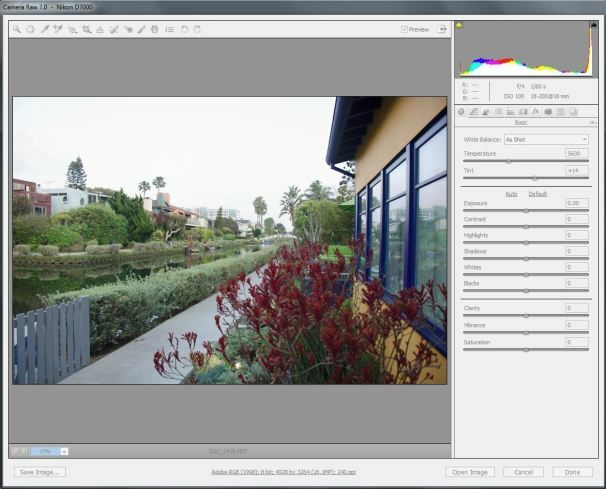 Accessing Adobe's Camera Raw is pretty simple: It pops up automatically whenever you try to open a RAW-format photo in Adobe Photoshop or Photoshop Elements. In fact, you might know Camera Raw as "that program you must click OK on in order to get a RAW photo into Photoshop." But instead of instinctively clicking Open Image--which sends the photo along to Photoshop Elements--take a look around. If all you want to do is tweak the photo, everything you need is right here in a streamlined interface. Near the top of the right pane, you should see three buttons. The first, Basic, is where you'll find all the color and exposure controls. Since you shot the photo in RAW, you know that the white balance might need to be adjusted. Drag the Temperature slider until the color is properly balanced (if you prefer to use a dropper to set the white balance by clicking on a neutral tone in the image, stand by--I'll get to that in a moment). Tint lets you fix the balance between red and green, as you'd expect. And the list of sliders continues from there, with sliders for adjusting overall exposure, recovering blacks, adding a fill light, altering brightness and contrast, and so on. For more controls, flip to the Detail tab by clicking the second button at the top. Here you can add some sharpening and noise reduction, if you so desire. That's not all--if you look at the icons at the upper left of the window, over the photo, you'll see controls for common tasks such as zoom and pan, as well as a white balance dropper (click on a white or gray patch in the photo to adjust the colors automatically). You can even crop and straighten the photo, though you don't have a way to specify a particular aspect ratio, such as 8 by 10. When you're done with the photo, you can click Open Image, which will send the edited photo to Photoshop Elements with all those edits already applied. Or, if you did everything you needed in Camera Raw and don't want to do any additional editing in Photoshop, you can click Done. All of your edits save automatically to an XML file in the same folder as the photo. The cool thing is that you've made lossless edits to the RAW file--the RAW file itself is unchanged, but anytime you open the image in Photoshop Elements, it will read the edits you made in Camera Raw from the XML file and apply them automatically. To undo any of the edits, just open the photo in Camera Raw again. If you have a different photo editor, its RAW editor should work much the same. The full version of Photoshop (with a "CS" in its title) uses a slightly different version of Camera Raw, packed with a lot of additional features. 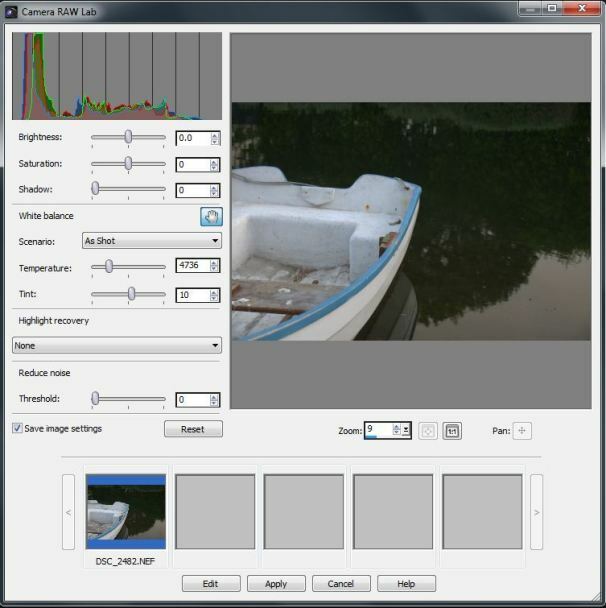 As you can see, it has all the essentials as well--white balance, exposure controls, color adjustments, and so on--though its features are arranged on a single screen. 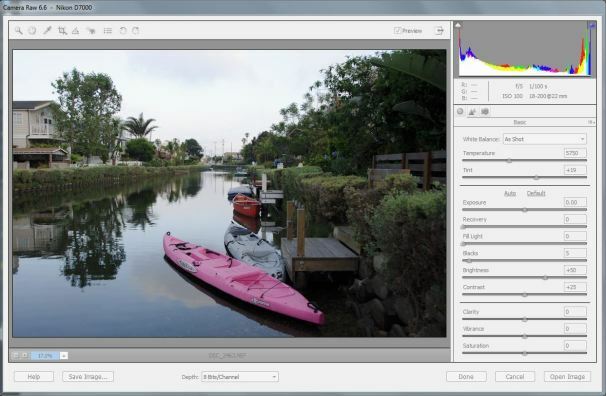 If you're used to Adobe's Camera Raw, however, you'll find a few things missing. Corel's RAW editor has no sharpening, cropping, or straightening tools, for example, so you'll need to open the photo in PaintShop Pro for those features. Camera RAW Lab is focused much more on basic exposure tweaks. No matter which program you use, though, a RAW mini-editor can be a huge timesaver. If you shoot in RAW, these programs are more than just intermediate clicks to get your photo into a full-fledged editor. Check them out today. Todd says that he captured this photo using a single, long exposure--and some glowsticks. Linda writes: "I shot this photo of my cat, Whiskers, through a screened patio door with my Nikon D3600. I edited it with Corel PaintShop Pro X3--I added the black-and-white film photo effect, which brought out his eyes and emotion in a way that I just did not see as well in the color version." Visit the Hot Pics Flickr gallery to browse past winners. Have a digital photo question? Email me your comments, questions, and suggestions about the newsletter. And be sure to sign up to have Digital Focus emailed to you each week.